"Poker player" redirects here. For the magazine, see Poker Player. Poker was developed sometime during the early 19th century in the United States. Since those early beginnings, the game has grown to become an extremely popular pastime worldwide. In the 1937 edition of Foster's Complete Hoyle, R. F. Foster wrote: "the game of poker, as first played in the United States, five cards to each player from a twenty-card pack, is undoubtedly the Persian game of As-Nas." By the 1990s some gaming historians including David Parlett started to challenge the notion that poker is a direct derivative of As-Nas. Developments in the 1970s led to poker becoming far more popular than it was before. Modern tournament play became popular in American casinos after the World Series of Poker began, in 1970. For more details on rules for the most common poker variants, see List of poker hands and List of poker variants. One or more players are usually required to make forced bets, usually either an ante or a blind bet (sometimes both). The dealer shuffles the cards, the player on the chair to his or her right cuts, and the dealer deals the appropriate number of cards to the players one at a time, beginning with the player to his or her left. Cards may be dealt either face-up or face-down, depending on the variant of poker being played. After the initial deal, the first of what may be several betting rounds begins. Between rounds, the players' hands develop in some way, often by being dealt additional cards or replacing cards previously dealt. At the end of each round, all bets are gathered into the central pot. At any time during a betting round, if one player bets, no opponents choose to call (match) the bet, and all opponents instead fold, the hand ends immediately, the bettor is awarded the pot, no cards are required to be shown, and the next hand begins. This is what makes bluffing possible. Bluffing is a primary feature of poker, one that distinguishes it from other vying games and from other games that make use of poker hand rankings. At the end of the last betting round, if more than one player remains, there is a showdown, in which the players reveal their previously hidden cards and evaluate their hands. The player with the best hand according to the poker variant being played wins the pot. A poker hand comprises five cards; in variants where a player has more than five cards available to them, only the best five-card combination counts. Poker variations are played where a "high hand" or a "low hand" may be the best desired hand. In other words, when playing a poker variant with "low poker" the best hand is one that contains the lowest cards (and it can get further complicated by including or not including flushes and straights etc. from "high hand poker"). So while the "majority" of poker game variations are played "high hand", where the best high "straight, flush etc." wins, there are poker variations where the "worst hand" wins, such as "low ball, acey-ducey, high-lo split etc. game variations". To summarize, there can be variations that are "high poker", "low poker", and "high low split". In the case of "high low split" the pot is divided among the best high hand and low hand. A complete hand is dealt to each player, and players bet in one round, with raising and re-raising allowed. This is the oldest poker family; the root of the game as now played was a game known as Primero, which evolved into the game three-card brag, a very popular gentleman's game around the time of the American Revolutionary War and still enjoyed in the U.K. today. Straight hands of five cards are sometimes used as a final showdown, but poker is almost always played in a more complex form to allow for additional strategy. Also known as "flop poker", community card poker is a variation of stud poker. Players are dealt an incomplete hand of face-down cards, and then a number of face-up community cards are dealt to the center of the table, each of which can be used by one or more of the players to make a 5-card hand. Texas hold 'em and Omaha are two well-known variants of the community card family. There are several methods for defining the structure of betting during a hand of poker. The three most common structures are known as "fixed-limit", "pot-limit", and "no-limit". In fixed-limit poker, betting and raising must be done by standardized amounts. For instance, if the required bet is X, an initial bettor may only bet X; if a player wishes to raise a bet, they may only raise by X. In pot-limit poker, a player may bet or raise any amount up to the size of the pot. When calculating the maximum raise allowed, all previous bets and calls, including the intending raiser's call, are first added to the pot. The raiser may then raise the previous bet by the full amount of the pot. In no-limit poker, a player may wager their entire betting stack at any point that they are allowed to make a bet. In all games, if a player does not have enough betting chips to fully match a bet, they may go "all-in", allowing them to show down their hand for the amount of chips they have remaining. Other games that use poker hand rankings may likewise be referred to as poker. Video poker is a single-player video game that functions much like a slot machine; most video poker machines play draw poker, where the player bets, a hand is dealt, and the player can discard and replace cards. Payout is dependent on the hand resulting after the draw and the player's initial bet. Another game with the poker name, but with a vastly different mode of play, is called Acey-Deucey or Red Dog poker. 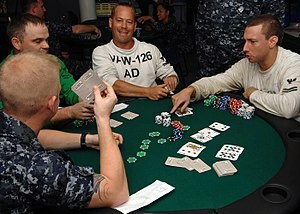 This game is more similar to Blackjack in its layout and betting; each player bets against the house, and then is dealt two cards. For the player to win, the third card dealt (after an opportunity to raise the bet) must have a value in-between the first two. Payout is based on the odds that this is possible, based on the difference in values of the first two cards. Other poker-like games played at casinos against the house include three card poker and pai gow poker. In a January 2015 article published in Science, a group of researchers mostly from the University of Alberta announced that they "essentially weakly solved" heads-up limit Texas Hold 'em with their development of their Cepheus poker bot. The authors claimed that Cepheus would lose at most 0.001 big blinds per game on average against its worst-case opponent, and the strategy is thus so "close to optimal" that "it can't be beaten with statistical significance within a lifetime of human poker playing". Less autonomous poker programs exist whose primary purpose is not to play poker by themselves, but is instead to calculate the odds of certain hand outcomes. For example, one might input a hand which contains three 7s and two unrelated low cards, the program in question would then return that holding just the 7s results in a 10.37% chance of an improved hand being drawn. ^ "World Series of Poker Retrospective: Horseshoe History". gaming.unlv.edu. Retrieved 2019-01-13. ^ Sklansky, David. The Theory of Poker. Two Plus Two Pub, 1999. ^ Bowling, M.; Burch, N.; Johanson, M.; Tammelin, O. (2015). "Heads-up limit hold'em poker is solved" (PDF). Science. 347 (6218): 145–149. CiteSeerX 10.1.1.697.72. doi:10.1126/science.1259433. PMID 25574016. ^ "Poker Probability". Simplest Solutions. Retrieved 2015-10-16. Look up poker in Wiktionary, the free dictionary.